Air Duct Cleaning Vancouver: Are You Allergic To Your House? Air Duct Cleaning Vancouver: An ordinary person breathes a large quantity of air in a single day. While individuals can endure several days without food and water, they cannot survive for even a short time without air. Air quality is worth your time to take note of, and air pollution is the vital environmental hazard to human health. Notably, indoor air pollution creates a grave health risk, and the fact that ordinary individuals spend most the time at home, the quality of indoor air is an issue, not to be left unnoticed. Several unique sources of air pollution contribute to lower indoor air quality. Regular air duct cleaning Vancouver can help reduce the effects. Volatile Organic Compounds or VOCs are the major indoor air pollutants. Volatile Organic Compounds include things like toluene, formaldehyde, and acetone, which effortlessly turn into gas, and contaminate the air. These harmful compounds are released by everyday household materials and items such as furniture, paint, cleaning supplies, printer ink, automobile fuel, and dry cleaned clothing. Other common household products like hairsprays, carpets, and candles, can also lead to indoor air pollution. In addition indoor dampness or moisture promotes mildew and mold growth, which have allergic responses to many people. 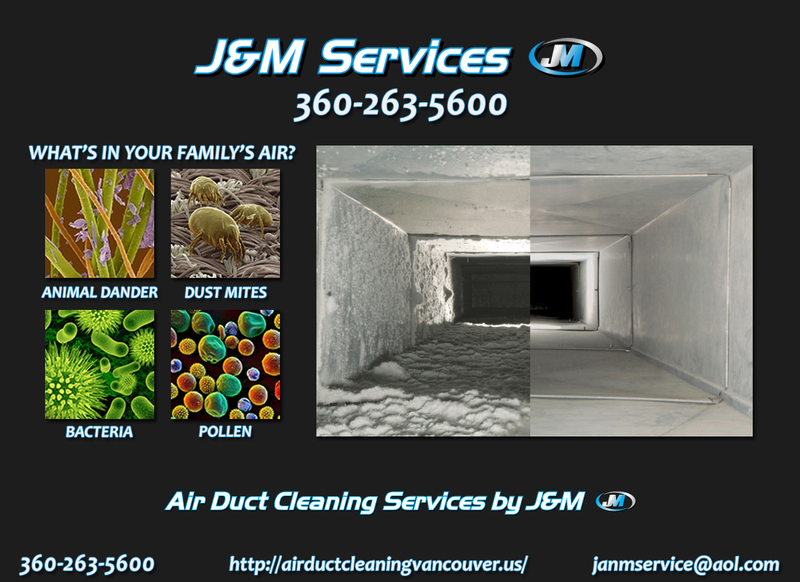 Air Duct Cleaning Vancouver by J&M Services is the premiere Air Duct Cleaning Vancouver company. We aim to raise indoor air quality knowledge and to educate our community on the finest residential and commercial solutions for all building types and structures in an effort to support healthy and environmentally friendly homes and workplaces. Air Duct Cleaning Vancouver by J&M Services believes that fresh and clean air is the only way to aerate homes and workplaces. We give counsel purely based on the measures of dealing with Volatile Organic Compounds and molds so that home and office owners achieve pollution-free spaces. We urge access to fresher air through the regular cleaning and maintenance of air ducts, and adequate filtration of incoming air supply to reduce VOC concentration in homes. Air Duct Cleaning Vancouver by J&M Services also supports the regular opening of windows and doors, use of ventilators and exhaust fans to minimize indoor moisture that promotes mold growth.